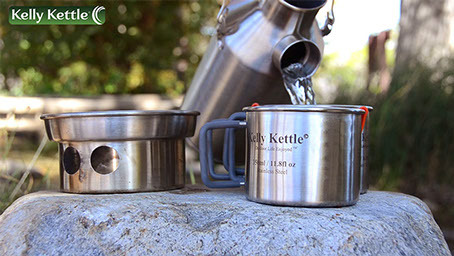 The Kelly Kettle Camp Cups are a new addition to the Kelly Kettle product line. These stainless Steel cups are perfect for any outdoor activity. The two cups come in two sizes, 12 oz / 350 milliliter and 17 oz / 500 Milliliter cups. The two sizes make packing one inside the other handy for packing your Kelly Kettle accessories inside your kettle. Inside the cups are stamped with measurement marks in oz’s and milliliters for ease of use. The best feature of all is when your done having your hot drink or warm meal, simply clean up, stack the cups inside each other, put the cups in the cook set or fire base and pack the Kelly Kettle in it’s bag. You’re ready for adventure. The Kelly Kettle Camp Cups, camping made easier. Boil water, cook fast, survive. Kelly Kettle, outdoor life enjoyed!